It's not particularly easy to design a unique magazine rack - the same ideas are knocking around endlessly. 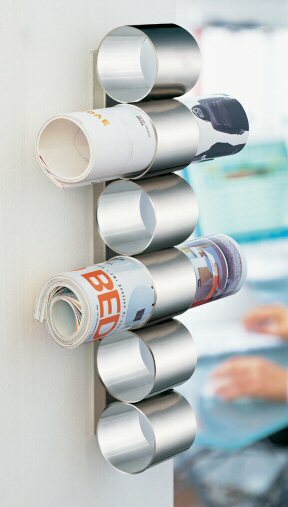 But finally I've found one thats completely different - The Tube Magazine Rack. I might have a problem stuffing my fancier mags in here - but it's certainly an attractive solution for the occasional food magazine I buy for the kitchen. It's only about $98 bucks, but unfortunately not available in the US. Hopefully there will be knockoffs everywhere soon. I love it... and the store that sells it.